Splinter Cell: Blacklist is the follow up to Conviction, and while all the traditional gameplay mechanics are still here, this is a whole new Sam Fisher outing. So are we past the glory days of stealth? Or is sneaking around still as fun as it always has been? If you're familiar with the backstory of Splinter Cell, you know that Sam Fisher isn't a guy you really want to mess with. 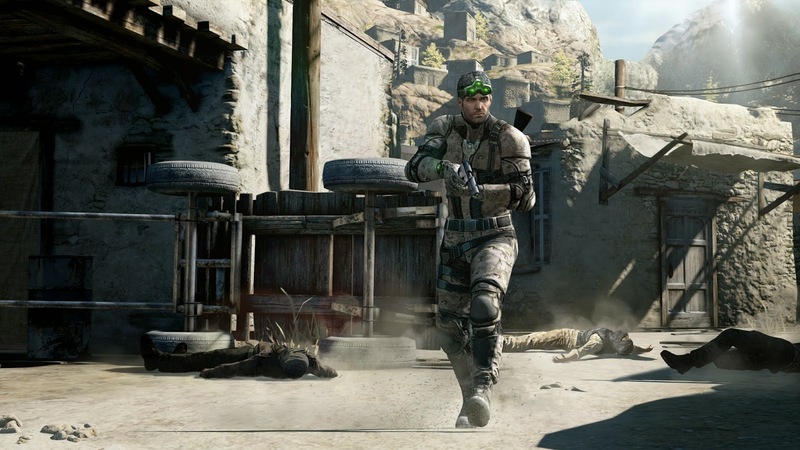 Following on from where Splinter Cell: Conviction left off, Blacklist sees Fisher pulled back into action during a brief period of retirement after Third Echelon was disbanded. Somewhat against Sam's will, he teams up again with Grimsdottir, and a couple of new faces to the newly appointed Fourth Echelon, Briggs, another Splinter agent just like Sam and Charlie, the tech guy. Sam climbs aboard the Paladin, a highly equipped flying fortress of a plane, to travel around the World to stop the Engineers, a terrorist cell who are causing random attacks on America known as the Blacklist, with their ultimate goal of having the US Military retreat from all overseas bases. 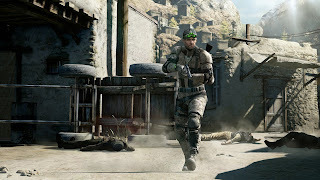 Splinter Cell’s main gameplay hook is stealth, getting in and out without ever being seen by an enemy or tripping any alarms has always been the ideal way to play, and while this still applies to Blacklist, you can also play it as more of an action game too. With the ability to customise both Sam's loadout to reflect your playstyle, you can really tackle any mission any way you see fit. If you like to go in silent and not be spotted, you can equip lighter armour with more pouches for gadgets and silencers for your weapons or if you'd rather go in guns blazing, equip some heavy armour to take more damage and modify your guns to carry more clips, or take armour piercing rounds to finish off the enemies quicker. You can't see me... oops wrong game. 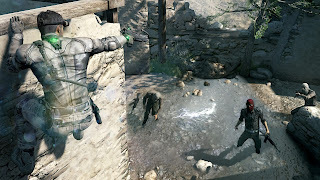 With this new play style in mind, there are some missions set out to be a lot easier if you opt for the more traditional stealth style of gameplay as well as some that are tailored for the more guns blazing among us, either way you tackle a mission, it always feels good. Sam has a large variety of close quarters combat at your disposal and because of this, disarming or incapacitating soldiers makes you feel like a real badass. As well as this, there's been a change to the time frame you handle some missions. In previous titles you always go in at night, so you can hide in shadows, but now there's some missions set in broad daylight and while it's still reasonable to sneak about in, it's a lot more challenging than to just dip into the dark spots to lose track of your followers. There are two major components that make up Blacklist's multiplayer. The two being Spies VS Mercs and co-op missions where you play as either Sam or Briggs to infiltrate places, usually for more information on the Blacklist. If you played Conviction, you’ll know what to expect, if not, then it's essentially like the Single Player but with an extra pair of boots on the ground to help at every turn. There are also times when one of you has to cover the other player as they try to get through enemy heavy areas. While these missions don't affect the overall story, it's nice that they're there to give you more background details, plus it's always fun to go sneaking about with a buddy, just make sure you have a mic as communication is key to victory. Spies VS Mercs is the competitive side of the game and has a number of different game types available. These range from straight up team deathmatch and objective based games which revolve around the Spies team trying to hack terminals and the Mercs to stop the Spies from fulfilling the captures. The real interesting thing about multiplayer is Spies play in the standard 3rd person view with all nimbleness of Sam from the main campaign, Mercs however play from a 1st person perspective and usually have much better weapons and armour, but lack the ability to climb about the areas like the Spies can. The more you level up in multiplayer gives you more unlock options on loadouts, if you like to customise yourself then be prepared to play the long game as you only get 1 option of what you want to unlock so to fully suit up, you're going to have to grind through a lot of games with basic equipment or use the default loadouts that are available to you. The other downside I found to multiplayer is if you play with anyone who already has the better equipment, you can find it very difficult to compete, multiplayer does not seem very new player friendly, so you're best off beating the single player before you even step into this. The whole point of Splinter Cell has always been working out the best way to get to your objective and level design plays a massive part in this, you really can tackle every part of this game in a multitude of ways. If you choose to go silent there's plenty of ledges you can jump over or use to hide in, with shadows available to melt into. From here all you need to do is slip past guards or remove them with lethal or nonlethal takedowns. Paring this with the huge arsenal of gadgets that you can use to distract or suppress enemies, there's many ways to go about a mission. Failing all that, you can always find a good place to defend yourself if you want to engage in a full on firefight. Sam himself has had quite the overhaul, with original voice actor Michael Ironside replaced by Eric Johnson, and with his face modelled after the actor, Sam who is supposedly getting on a bit now looks younger than ever. If you've been playing since the older games, this seems a tad off, but you soon get over it as the game itself feels kind of different to the classics. While graphically the game looks impressive but saying that, there's a lot of issues with screen tearing, this is most visible in the cutscenes between missions, it's not a huge issue as it doesn't really happen so much in the actual gameplay sections. Sound in the game is nice and when the story gets a bit tense, there's some nice musical touches to keep you on the edge of your seat. 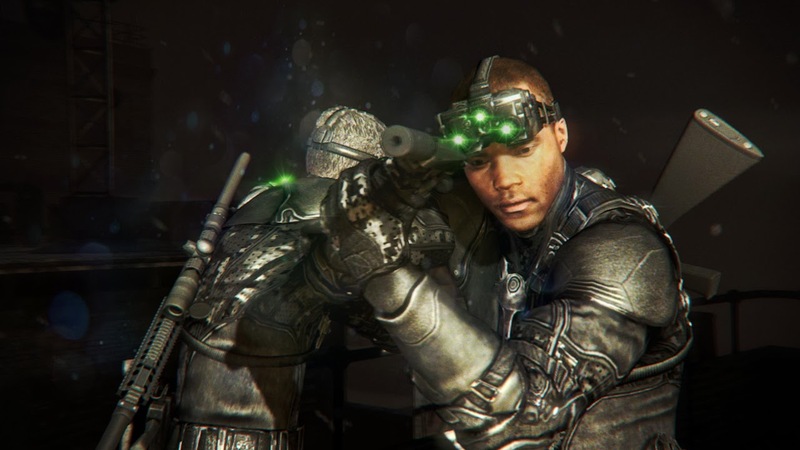 Blacklist offers up its most versatile game in the Splinter Cell series so far and playing anyway you like has really pushed this game forward as one of the best in the franchise. For me there's no better feeling than sneaking through an entire level without ever being noticed. It's a shame that the multiplayer is unbalanced for newcomers and this game has really made me hate dogs...digital dogs obviously. I'm not a huge fan of the multiplayer but it does have its charms and switching up the view modes makes for a very interesting dynamic.